The definition of “home” is becoming more and more political in Seattle. Is a truck a home? A county judge ruled yes, but Seattle is appealing. Are tiny-house villages homes? Some local leaders say yes, but the federal government still defines the people living in Seattle’s tent camps as homeless. Home can mean different things to each of us. 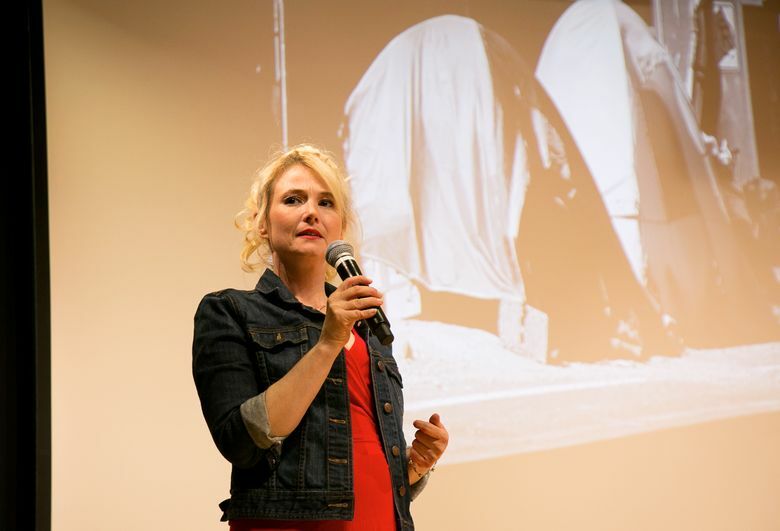 That’s why we’re hosting a night of storytelling called Stories About Home, in partnership with Seattle University’s Project on Family Homelessness and the Seattle Public Library, on June 6, 2019. The event will be at 6:30 p.m. at Pigott Auditorium at Seattle University. But for this to happen, we need your stories. How long should the story be? This event — like our ‘Ignite Project Homeless’ event last year — uses the Ignite speaker format: five minutes, 20 slides, with each slide timed to appear for 15 seconds. The format is designed for first-time presenters, although we welcome pitches from experienced speakers. Here’s a link to the rest of the stories from last year. We accept story pitches from people of all ages, employment and educational backgrounds, and we want to have a speaker list that reflects, as closely as possible, the racial makeup of the homeless population, which is disproportionately people of color. We’re looking for people who can offer insight into the experience of homelessness and housing insecurity, including making ends meet for rent or a mortgage. That could mean you’ve experienced losing your home, worked closely with people who are without a home, or volunteered at a shelter or outreach program. Maybe you were homeless and now you’re advocating for change based on your experience. Maybe you are working to help address affordable housing in Seattle. Maybe you’re still without a home, but you’ve found something that keeps you hopeful during the hard times. Call 206-464-2202 and leave us a voicemail. If you have any accessibility issues that make using a phone difficult, email me at sgreenstone@seattletimes.com and we can accommodate. Try to keep it under five minutes — that’s all the time you’ll have for the talk in the end, anyway. Your ideas don’t have to be completely fleshed out; just tell us your story. The more specific the better. Also think about how you could illustrate your story with pictures and slides. No business pitches, or stories promoting a brand, company or your nonprofit. Make sure to include an email address and phone number. If you want to be extra sure we received the message, send a follow-up email to me at sgreenstone@seattletimes.com. Put “Stories About Home” in the subject. If my pitch is accepted, will I get help along the way? Yes. We will have story coaches working with you on the content of your talk, how you present, the photos you pick, making your slide presentation, and tips for speaking in front of an audience. Don’t worry if you haven’t done a lot of public speaking. We want to hear new voices. In addition to the event on June 6, there will be two training sessions at The Seattle Times building in downtown Seattle on May 18 and June 1, and a rehearsal on June 5. If you need help with child care or transportation, please let us know. What’s the deadline for pitching? Monday, April 22, 2019, at 11:59 p.m. We’ll be contacting people with the decisions by May 1.